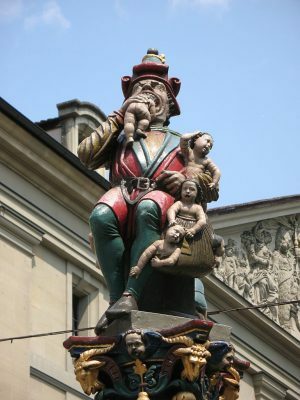 In the middle of the city of Bern, Switzerland, there is a fountain above which stands a statue of a man eating a sack full of babies. No one knows why it’s there or where it came from. The fountain sculpture towers above the ground, one baby half stuffed into the man’s mouth, and a sack full of three more alarmed tots slung over his shoulder presumably for later snacking. The unsettling sculpture is no modern work of art; built in 1546, it is one of the oldest fountains in the city. Was it a folkloric representation of Kronos, father of the Greek gods, who ate his own offspring? Was it a veiled threat to the town’s Jewish population? No one knows for sure, but it’s a fact that Der Kindlifresser (“eater of little children”) has been creeping out tourists and residents alike for nearly 500 years. Read about this bizarre sculpture and some theories about its creation at Atlas Obscura!